Find out how this patient group helped people with their GP’s online system. GPs are encouraging more people to book appointments online. You can also use the online system to order repeat prescriptions and look at medical records. Barry Lynch the Chairman of Haddenham Medical Centre PPG told us what they’re doing to help their patients get online. The number of patients using online systems is surprisingly low, mainly due to the arcane process of registration. Unfortunately, we are not aware of any NHS initiative to ease this process and the only apparent solution is to give “live” 1 to 1 help to patients to help them get up and running. In 2018 we found that many patients weren’t sure how to use the online systems. We found that a large number had signed up to use the system but hadn’t registered properly to get started. Others found it difficult to operate their own devices (whether it was a laptop, mobile phone or tablet). So we thought some IT coaching and help with using their own devices was also needed. 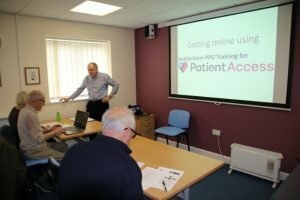 The Haddenham PPG set up a training programme to help patients use “Patient Access”. We couldn’t get any support from Emis, the software company providing “Patient Access”. Our requests for help went unanswered. We realised quickly we were on our own with this enterprise! We made a Power Point presentation which goes through all the registration steps and then the system’s various features. In October 2018 we held our first training session and have continued with further sessions every couple of months. Many patients needed 1 to 1 help. So besides presenting the slideshow we had several PPG volunteers on hand to give individual help. We found that the surgery was the best place to hold the training sessions. This meant the reception staff were on hand to check the patient IDs (as required by the registration process). It also allowed us to print out registration details and reset patient accounts that had locked out due to too many incorrect log in attempts. What do you think of online services like Patient Access? Would you like to see more or less of them in the future? Make sure you take part in the NHS survey to have your voice heard. One comment on "Helping Patients with “Patient Access” Online System at Haddenham Medical Centre"
Although I am quite ‘tech-savy’ and attended one of the clinic training sessions, I have had to register a few times and all without success. Each time I have been told by the computer that I cannot get be registered for online appointments etc. It is probably a good idea therefore to ensure the system is fit for purpose before exhorting patients to join the party!? PPG success story – 6 tips to increase membership Patients, Power and Partnerships! What happens when patients take an active role in their PPG….